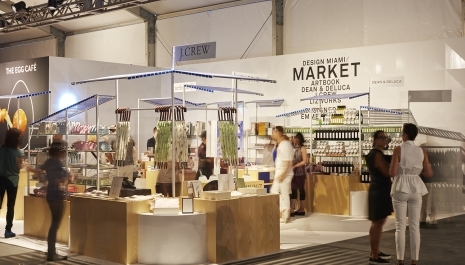 The Design Miami/ Market brings a new kind of product to the fair, with a curated selection of design-driven retail that features unique brands and independent retailers offering custom and limited-edition objects, ornaments, accessories and edibles. Each year Design Miami/ commissions an emerging talent to design the Market. The first edition was imagined and produced by local designer Emmett Moore. Moore’s version of the Market played with the notion of a traditional outdoor marketplace and drew heavily on South Beach for inspiration. The Market brings the beach to Design Miami/ with kiosks made of whitewashed wood and canopies reminiscent of beach loungers with their blue vinyl strapping. The white Astroturf under foot brought the various elements together, with the whole scene acting as a playful reminder of Miami’s tropical environment.